Inside Outside, by Brian Turner (Victoria University Press, 2011) 134 pp., $30.00; Chords, by Sam Hunt (Craig Potton Publishing, 2011), 84 pp., $29.99. On the face of it, there doesn’t appear to be a great deal in common with the two poetry brands this pair of solitary men have come to represent: Hunt the rock-n-roll bard from the 1970s, who survived to open for Leonard Cohen forty years on, living in bays by the sea; Turner, he of a famous Otago sporting nobility, the tussock-and-matagouri-entangled rear-guard sniper, holed up deep in the Maniatoto. Yet considered backed into their respective and preferred hideaways, they share some obvious similarities: Turner will clock seventy in 2014, health permitting and Hunt should be on the pension very soon, if not already. I still hear her singing. Those who write off such naked simplicity and apparent artlessness as poetry for the stage, and not the page, miss several points, not least that Hunt’s minimalism comes from years of honing the voice for both mediums, as well as reading and ‘telling’ the poems of others (Baxter is a favourite, but he will ‘tell’ any poem he loves). He uses ‘tell’ for recite — which is revealing in itself: the poem is part of a tale, a story, a conversation the poet is having with the world and the material. In a somewhat ironic state of affairs, through a love of the written word, Sam Hunt keeps burning the flame of a pre-literate orality. to follow, how easy to dispense. Make sure you make sense, he said. Sense makes us, I said. Reach for the stars, he said. The stars reach us, I said. Waste not want not, he said. We’re all wasting away, I said. Coming on the back of his recent brush with a potentially fatal illness, there is a little more there of the personal than might appear in the word games and bromide inversions that lead to the poem’s conclusion, that we’re all just “guestimates”. The final section of the book, Post-Operatives, explores at some length Thomas Browne’s pithy assertion: “for the World I count it not an Inn, but an Hospital; and a place not to live but to dye in”. [i] Turner is eyeing an end we mostly prefer to ignore. Where the spare lineation in this man’s work often sets forth an existential dilemma, an anthropological observation on homo ridiculous, or the stark outlines of rural life à la Ted Hughes, Sam Hunt more often than not circles back to the personal and the private place — that dangerous minefield where the self is mythologised. Surviving youth’s self-indulgence and keeping at his trade, he knows what he is doing. When he digs around inside himself to have — for instance — a dreamtime conversation with his dead mother about the birth of her first great-grandchild, there’s nothing maudlin here. it was your voice that woke me? Hunt can skate thin ice like this because, more often than not, he’s enough of a pro to know where the cracks are and when to stop. At times, these spare, cryptic runes seem to come too easily, as if the Sam Hunt Sat-Nav System is easing our passage down unfamiliar roads, but with the comfort of a voice we can recognise and know only too well. Then suddenly, seemingly on cruise control, he can demonstrate once more that he’s a master painter of the margins he inhabits — and very funny, too. It’s not a river. Of course. and, now and then, isn’t. There is plenty of dark here amongst the light, as Hunt gets down and dirty with mortality. I have to confess I was swept along by this vigorous, sometimes marvellous collection — especially the Chord poems — spitting out the inevitable piece of flotsam as the book’s high tide peters out. 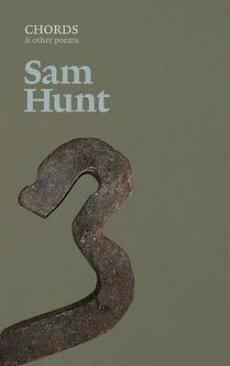 Some of the new poetry I read these days, though deservedly praised for its intellect and cleverness, leaves my heart cold, but I thoroughly enjoyed the warmth in Hunt’s lines. Next stop perhaps, a live gig in Raglan, or Haast? are tremulous in the wind. and sheen and kindness and care. if she hadn’t been there. He’s at his best though when he eschews the philosophical, and goes straight for the graphic: anyone who gets halfway through ‘Rabbits’, a voyeuristic poem where the poet stumbles upon — and minutely depicts — a pair of bonking lovers swapping positions in the great outdoors, will be very glad it wasn’t them Turner spied going at it. It’s a nature poem with a difference: the force of a John Clare, directing a gaze even he could not have maintained. and they ride it into the ground. Well, what if he’s right? Even in his bleakest post-operative moods, having stared down death up close, still wanting to believe ‘There must be/an accounting that makes sense’, his yearning for the solace of human love can resolve itself into the spare monometrics of a poem like ‘Too Slow (for Tulip)’. Tulip – also the subject of ‘If She Hadn’t Been There’, cited earlier – must have been quite a woman. JEFFREY PAPAROA HOLMAN has worked as a sheep-shearer, postman, and social worker. He has written several collections of poetry, the latest of which is Fly Boy (2010). He is this year’s Writer in Residence at the University of Waikato. As big as a father (2002), was long-listed for the Poetry Category of the Montana New Zealand Book Awards 2003 and the title poem also won the 1997 Whitirea Prize.